First DAICO iteration has ended and will serve as proof of concept. you can follow the tutorial on the CashBack page to retrieve your investment. Everything is provided under the MIT License unless stated otherwise. From the inputs entered by the Project Owner in the Creation Wizard, BlockBits algorithms are automatically creating a series of risk indicators for each submitted project. These are strictly mathematic indicators based on the nature of token minting policy, accepted types of funding, relations between milestones and many others. Just like in software development, most projects can be split up in "Phases". We call them Development Milestones and each one has a percentage of the raised funds linked to it, and requires community acceptance in order for funds and tokens to be released. Each Investor has their own separate smart contract, that stores and locks ETH and tokens until an action is available. This contract mitigates issues that can arise from hacking attempts, even successful ones, by enforcing 2 hardcoded output addresses, namely, the platform and investor wallets. BlockBits token holders have unprecedented power. They can create and vote proposals and once voted they are automatically implemented. It is not a consultative but an executive vote! During the course of platform development, project owners are not able to use their tokens in any way, they cannot sell them, nor can they vote on proposals. Most of BlockBits revenue is spent on the BuyBack program which buys BlockBits tokens. These tokens are burned and the value of the remaining BlockBits tokens constantly increases. Check out the Contribute Page for detailed statistics and results. Direct Funding payments will lock ETH until either the project is successfully funded, or it fails. If the project is successfully funded, the ETH is released to the platform's multi signature wallet address, and tokens get sent to the vault's owner wallet address. If the project's funding fails, the funds are unlocked and can be claimed back by the vault's owner. * This gives you all the tokens once funding is successful and you get to moderate the platform as long as you own the tokens. Milestone Funding payments adhere to the same rules as Direct funding when it comes to incoming funds and release in case of funding failure. The fundamental difference is that, if the project's funding is successful, funds and tokens get released only upon successful completion and voting by investors in development milestones. * This gives you a percentage of the tokens each time the team delivers on a milestone. You get to moderate the platform and validate the delivery of development milestones. * Project's tokens are locked for the entire duration of the Development Milestones. * Bounty pool tokens are released upon funding completion. Minimum required functionality in order for token holders to be able to validate and vote on proposals. Minimum required functionality to allow 3rd party projects to launch through the platform and allow token holders to participate in funding events that include discount programs. Minimum required functionality to allow Code Upgrades to be processed in order to enable Token Buyback for the main platform and launched children projects. Basic Risk analysis and indicators for projects and Collaboration tools for the Creation Wizard. Advanced functionality for project creation, risk analysis and indicators for project page details. Allows token holders to propose upgrades and get paid for them. Project gets prepared for completion, where no one owns it. If you haven't already, sign up for a Bounty Portal account and earn tokens by spreading our mission. * Launched on the 14th of January 2018. A complementary application you can install on your phone, to get notifications about events and news related to the platform. It will notify you each time you, as an investor need to vote for a proposal in the platform, or when a new project is launched. 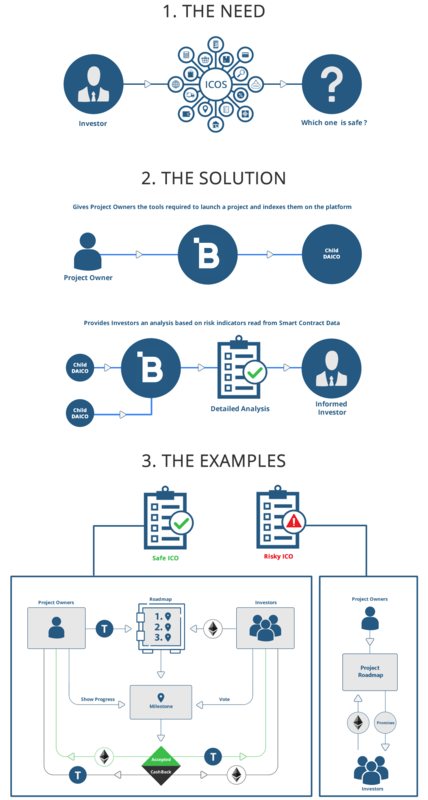 The BlockBits DAPP Creation Wizard is the main step a Project Owner has to perform in order to launch a new project. After the wizard setup is completed the new project is not only listed on the BlockBits platform but it also becomes a self sufficient DAPP on the Ethereum blockchain. * Implementation details can be found in our documentation. * Everything is provided under the MIT License unless stated otherwise.